Heart Evangelista loves to spoil her dogs: "Sky's the limit!" Heart Evangelista wants to give her pet aspins the best kind of life: "Oh, I spoil them so much... Sky's the limit." Heart Evangelista is known as an animal lover. In fact, had she not entered showbiz in her teen years, Heart would have been a veterinarian. She takes after her dad, "Super dog lover siya," Heart told the press at the animal shelter's headquarters during the media launch of her latest campaign with Philippine Animal Welfare Society (PAWS) on August 23. She said, "I grew up with a lot of dogs. Siguro mga 20 plus mga aso namin sa bahay, so lumalaki ako na iba-iba aso namin. "Meron kaming aspin, meron kaming German Shepherd—iba-iba sila. I grew with that talaga, so that’s why bata pa lang ako gusto ko nga maging vet dati dahil doon." "Aspins" or "Asong Pinoys" are at the center of Heart's animal welfare advocacy. 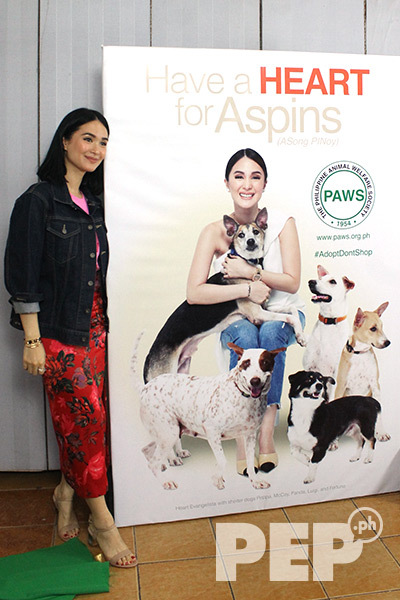 The GMA-7 actress-host joins PAWS in its campaign to change people's perception about aspins. Together with PAWS' Program Director Anna Cabrera, they want people to stop referring to dogs roaming the streets as "askals" or "asong kalye" to "aspins." "Ever since before, we already had aspins, they weren’t considered to be the doorbell of the house, the alarm. "They really slept with us, so parang for me, it was very normal…"
People often see aspins as rowdy, unfriendly, and scary, but as Heart pointed it, these dogs are victims of circumstances. She explained, "Tumatahol sila at nafu-frustrate sila kasi wala silang tubig, nakatali lang sila. "Honestly, it’s really just a mindset na nangangagat, yung first ever na dog na kumagat sa akin was a German Shepherd. "Nilata ako sa likod so, you know, it’s really not about the breed. It’s really not. It’s really just a mindset. "That’s why ang laki ng difference when you change ‘askal’ to ‘aspin’ because it changes everybody’s thinking." In her Instagram post, Heart said, "I understand how [aspins are] beautiful and gentle animals who are equally deserving of love as any other pet." Panda is one of the aspins that Heart has welcomed into her home. The dog has since been a part of Heart's Instagram feed. Panda was only a puppy when Heart's dad found her in Batangas. Heart fostered Panda in her home, "Nagkaroon ako ng feeling na hindi ko pala siya kaya ibigay." She recounted how it came to a point when she begged her husband, Senator Francisco "Chiz" Escudero. "Iniyakan ko pa si Chiz, ang dami na naming aso sa bahay, so binalik yung kumuha sa kanya and then napunta siya sa akin." In a separate interview with PEP.ph (Philippine Entertainment Portal), Heart didn't hesitate to admit that she loves to spoil her dogs, most especially Panda. "She grew up, not really good situation. I want to give her a really good life," Heart said. And for her dogs, she said she hasn't been counting the cost. "Sky is the limit. I don’t have a budget for them. I definitely take good care of them. "For example, if I were to tie up with a brand, I don’t charge as much as long as I get good supply of dog food, shampoo. "I use it for [my pets] and I also donate it. I make it work, and I make sure that I use my being an artista to also help them." How much has Panda changed since she became part of Heart's family? "Before she used to hide under the sofa, you can’t go near her. "Now, she’s more sociable, I bring her everywhere. "She’s good with other dogs as well. She’s very, very well-behaved. "You can take her in a restaurant, and she can sit on a chair, and she’ll stay there. She won’t eat your food. "She’s actually very, very sosy!" And sosy she is as Panda sometimes sleep on a PHP81,000 Hermès blanket!